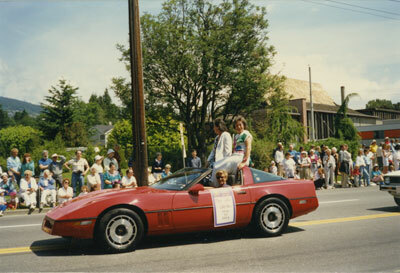 Car marked "May Queens 1939-1973" in Community Day Parade, June 6, 1987, with participant Daphne Grisdale, library staff member. Scanned January 2012 using Epson Perfection V700 Photo at 300dpi and 100% of original image size. Alternate Versions: Lossless TIF from original scan at 300dpi and 100% of original print. W13 x H9 cm colour print on photo paper.